2/11/2017–DURHAM, NC–The NC Wing held its 2017 Wing Conference and Awards Banquet on 3-5 Feb 2017 at the newly opened JB Duke Hotel on the Duke University campus in Durham. Approximately 250 cadets and senior members attended the exciting weekend. On Friday night, the senior members enjoyed an evening reception, while the cadets gathered in the Cadet Hospitality Suite for Ranger Staff Training and fun and games. Saturday morning began with the General Assembly where more than 135 awards were presented to members throughout the Wing. Lt Col John Maxfield humorously emceed the General Assembly. In addition to the Wing Command staff, honored guests included Col Larry Ragland, Col Eugene Egry, Col Dennis Barron, Col David Small, Mr. Eric Todoroff and Mr. Eric Fryar. The General Assembly’s award presentations started on a high note when the CAP Silver Medal of Valor was presented by Col Ragland and Col Barron to C/Lt Col Aiden Maxfield for his valiant efforts to save his grandfather’s life. 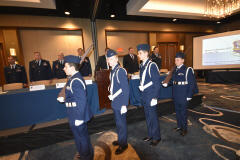 Col R. Jason Bailey, North Carolina Wing Commander, then presented over 100 awards to members of the NCWG recognizing a variety of outstanding service. Col David Crawford and Maj Dennis Bissell received Exceptional Service Awards for their relief work during Hurricane Matthew. Maj Michael Willis received an Exceptional Service Award for his service as the Apex Comp Squadron Commander and Deputy Commander for Cadets. 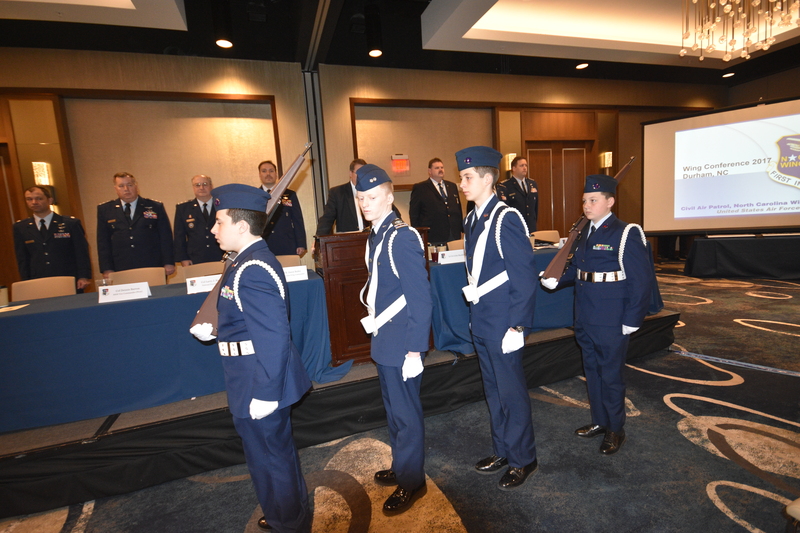 Meritorious Service Awards were presented to Lt Col Ron Cheek, Cadet Eve Allen, Cadet Kyra Willis, Lt Col Bob Annechiarico, Lt Col Raymond Davis, Lt Col Shelly Gonzales, Maj Brendan Kearns, Capt David Stange, Capt Rick Paxton and Maj Chris Bailey. Col Jason Bailey, North Carolina Wing Commander, presented 38 National Commander’s Commendation awards to members of the Wing who excelled in their duties during the Hurricane Matthew disaster relief operations. An additional 17 Region Commander’s Commendations were presented for service during Hurricane Matthew and 3 Region Commander’s Commendations were presented for service during Encampment. U.S. Army Certificates of Achievement for Hurricane Matthew service were presented to Cadet Brannan Massey, Cadet Brendan Kearns, Lt Col Jeffrey Focke, Lt Col Lucy Davis and Maj Dennis Bissell. Coast Guard Certificates of Appreciation were presented to Cadet Brannan Massey and Cadet Brendan Kearns. Lt Col Robert Bauer, Lt Col Max Benbow, Maj Barry Feinstein, Maj Joseph Myers, Maj Kathleen Nicholas, Capt Paul Carnes, Capt Rick Paxton and 1st Lt Phillip Hooper received Wing Commander’s Commendation Awards for their work in developing and directing the Wing’s Professional Development Courses. Lt Col Dennis Favar received a Wing Commander’s Commendation Award for his End of Tour. Lt Col Ricky Lyerly completed both level 4 and level 5 of the CAP senior member professional development program and was awarded the Paul E. Garber Award. Maj. Barry Feinstein and Capt Gene Merklin were presented their Gill Robb Wilson Awards. Captains Ralph Flow and Tracie Langley were presented with their Grover Loening Awards and promoted to Major. Capt Barry Feinstein and Capt Alberto Griffa were also promoted to Major. Unit Charter presentations were made to the Guilford Comp Squadron and to the newly-chartered Group 6. A plaque was then presented to representatives from the NC Maritime Museum in Beaufort for their CAP historical display. The Wing Commanders Call and educational sessions followed the General Assembly. The morning and afternoon breakout sessions included information on the Coastal Patrol Base 21, What’s New in Cyber, Drones, Retention, The Road to Command, Lessons Learned, Operations at the Squadron and many more. Saturday evening’s highlight was the Awards Banquet emceed by Maj Chris Bailey. Col Larry Ragland, CAP’s National Executive Officer and former NCWG Commander, was the keynote speaker. Col R. Jason Bailey, NCWG Commander, presented the Cadet of the Year Award to C/Lt Col Brendan Kearns and the Senior Member of the Year Award to Maj Arnold Andresen. Group 5 received the Outstanding Group of the Year Award. Following the banquet on Saturday evening, the cadets danced the night away at the Cadet Ball. As Saturday night turned into Sunday morning, the NCWG celebrated together the amazing year just passed and all the accomplishments that they achieved together.